Our Stony Point Pest Control Exterminator will identify the source of the pest infestation & create a customized treatment plan to eliminate the pests. 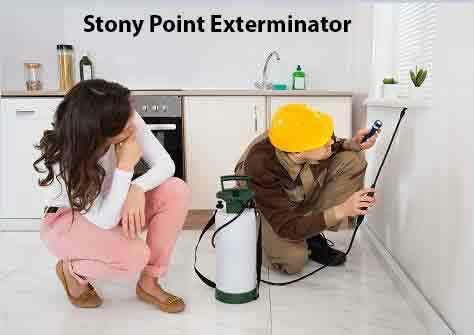 Let us be your Stony Point Exterminator, give us a call today 1-844-305-8999. Termites are capable of inflicting a lot of damage to the property around your home as well as the structure of the home. Termites are commonly recognized as an unwanted pest in homes. They cause billions of dollars of damage annually. They eat dead plants, wood, animal waste and other crops, they are known to cause damage to the wood your home was constructed with. These insects inhabit large colonies, and they engage in swarming behavior. If you have termite infestation on your property, contact our Stony Point Exterminator at Dependable Exterminating as soon as possible. The longer you wait, the harder the problem will be to solve, as every day that the termites are in the home, they will cause more damage and make your repair costs higher. There are several types of Bees and Wasps and Hornets that may appear in your yard, and any of them can be cause for concern if you spot large groups, swarms or nests. Bees are generally small and bulbous with fuzzy bodies and dark legs. Wasps are longer and their bodies contain three distinct black segments with yellow bands or spots along with spindly legs and wings. Bees usually build hives while wasps construct nests. You may find these in trees, in the leaves on your roof or even inside walls. The closer the "home" of the insects, the higher the potential that they'll wind up where you don't want them. At Stony Point Pest Control, we specialize in Bee Hive Removals, Hornet Nest Removals and Wasp Nest Removals. Same Day Service Available. Give Us A Call Today. 1-844-305-8999.